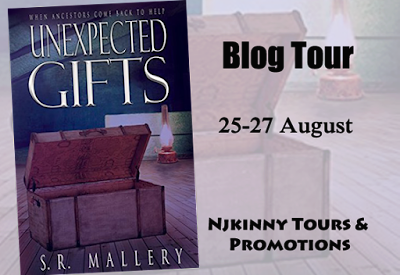 Today, I am so happy to have SR Mallery, the bestselling author of Unexpected Gifts on my blog. Welcome to Njkinny's World of Books & Stuff, Sarah! 2) What genre are your books and why did you choose this genre? My stories/books are primarily historical fiction. Because I also enjoy writing more up-to-date stories who knows about the future, but for now, I get so much pleasure researching past times, I have decided I am going to stick with historical fiction. 3) In one sentence what is your book, “Unexpected Gifts” about? A ‘lost’ college student, forever choosing the wrong man, learns to how to change her life’s path by reading her ancestors’ diaries, journals, and letters. 4) How did you get the idea of writing this book? What kind of research did you do? One night many years ago when I was visiting my father, my then two-year-old daughter and I were in bed together. She was nestled up against me, sleeping peacefully; I was reading a short story my mother had written many years before. As I lay there, taking in my mother’s words, a feeling of comfort and wonder overcame me. ‘There are three generations in bed tonight,’ I remember thinking. That awareness catapulted me into the idea of a confused modern woman retracing the lives of her ancestors through their diaries, journals, and letters, and in the process of seeing their mistakes, learning what not to do in her own life. As for doing research it was a huge job. I immersed myself in books regarding various 20th century U. S. time periods so I could learn about their lingos, fashion, and customs. I watched documentaries and listened to homemade and commercial CD’s that included songs/music written during the 60’s, 50’s, 30’s, and early 1900s, to help me live and breathe those eras. And always, always, I scrutinized photographs—a practice that not only always sends me back in time, it triggers plots, motivations, and character relationships. 5) What was the hardest part of writing “Unexpected Gifts”? Because I had decided to have my main modern protagonist, Sonia, learn from her ancestors, I had to figure out a helpful method to accomplish that. So I came up with a two-columned sheet. On the left side was each ancestral chapter with several flaws that each ancestor had. In the right column I wrote how those particular flaws gave Sonia the insight into how to change her own behavior. Although time consuming, it grew into a back and forth, analytical process all of which was incredibly helpful. 6) How do you approach your writing so as to make them relatable to readers? I have come to realize that no matter the time period, no matter how different the culture, people have always been people---with hurts, anger, ambition, shame, joy, and love. That has never changed! So when I write a scene, or in particular, a dialogue, I really picture myself being there, first asking the questions then answering them. I always ask myself, ‘What kind of language would I use? If I were an immigrant coming over from another country trying to speak English, how would I sound? If I were an educated journalist from the Great Depression, wouldn’t my language reflect that? If I were an Irish lass back in the 1920s, how would I talk? There, I not only studied the slightly different grammar structure used by the early 20th century Irish, each time I edited that chapter I read the words out loud with an Irish accent! 7) Tell us a fun moment you had while writing “Unexpected Gifts”. 8) When did you first realize that you had the talent to be an author? My father, who had been a television writer for many years (he began his career in The Golden Age of Television), read my very first story, “Sewing Can Be Dangerous,” and shook his head. “What? What? No good? Am I terrible?” I asked him, chewing on a fingernail. “Well, maybe your language is a tad simple…but your storytelling and your pacing is amazing! Keep it up!” Boy, was THAT an incentive to keep going! 9) What were the steps you took to get your book published? My SEWING CAN BE DANGEROUS AND OTHER SMALL THREADS came first. I had a lot of interest from agents, although they were worried about marketing a newbie’s collection of shorts. Then I got a New York agent who flipped over them and wanted to represent me. But she had a condition. I had to finish the novel I had begun (UNEXPECTED GIFTS) so she could present/sell both of them at once. I remember killing myself at that point in time--teaching ESL classes morning and night and scribbling furiously in between to finish my novel. I knew UNEXPECTED GIFTS was far too long and was almost like a first draft but I handed it in. Although she really liked it and told me what a good writer I was, etc, etc, she decided she wasn’t going to represent me anymore. Period. Done. Of course I was devastated, but I picked myself up and started sending both books to publishers. One small press loved them so much she immediately wanted to sign me up. So my first foray into the publishing world was through this press. They were lovely to me, but after a while, I decided I preferred having more control, particularly since the publishing business had been changing exponentially and being an Indie writer was no longer looked down on. 10) What is next for you, writing wise? 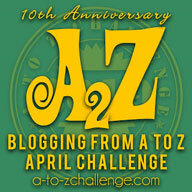 11) What is one quirk that, in your opinion, makes you a writer? Well, much like my main character in UNEXPECTED GIFTS, I have OCD (Obsessive Compulsive Disorder)—the ruminating kind, not the hand washing neat freak kind! In other words, I can’t stop my brain from working overtime and creating plots, scenes, and characters! 12) Before you go, how about an excerpt from your book to intrigue and tantalize us? In Unexpected Gifts, that is precisely what happens to Sonia, a confused college student, heading for addictions and forever choosing the wrong man. Searching for answers, she begins to read her family’s diaries and journals from America’s past: the Vietnam War, Woodstock, and Timothy Leary era; Tupperware parties, McCarthyism, and Black Power; the Great Depression, dance marathons, and Eleanor Roosevelt; the immigrant experience and the Suffragists. Back and forth the book journeys, linking yesteryear with modern life until finally, by understanding her ancestors' hardships and faults, she gains enough clarity to make some right choices. Thanks for taking out time to talk to me, Sarah.